Arnold used the notes G and E♭ (German: Es i. ). 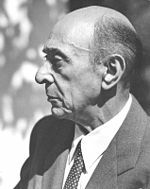 Later his name would come to personify pioneering innovations in atonality (although Schoenberg himself detested the term "atonality" as inaccurate in describing his intentions) that would become the most polemical feature of 20th-century art music. During the rise of the Nazi Party in Austria his music was labeled as degenerate art. He used the standard German spelling Schönberg until after his move to the United States in 1934 (Steinberg 1995 463) whereupon he altered it to Schoenberg "in deference to American practice" (Foss 1951 401) though one writer claims he made the change a year earlier (Ross 2007 45).